Many people who took term life insurance at a young age must have enrolled in the policy at a much lesser rate due to their health and age. The insurance companies suggest that it can be a beneficial tool to cover-up the uncertainties in life and for our obligations towards our family. By the time the term of the life insurance policy ends the insured person has made considerable savings, the kids have grown up to earn a living on their own, and all the home dues are paid off. But at times the problem is that things do not work out as closely as we have planned. In some instance the person may lose his or her job and the home dues are not paid off as was planned or thought of. To make matters worse the kids may be still on their way to complete the four year college. And to add on to that the savings and investments did not build up as planned due to fluctuations in the market. It is during this time that we need the right type of life insurance as our old policy gets expired. Insurance companies too, realized this fact and they have come up with different plans for people in their 50’s or 60’s. A person can expect to have coverage even for 30 years provided that the person has maintained a good health. The premium varies with the location of residence of the person along with the age, health and occupation. So it is not possible to get exactly the same insurance quotes as any of your known person enrolled in who is living in another state. The coverage amount that can be offered to you also differs with the above given parameters. 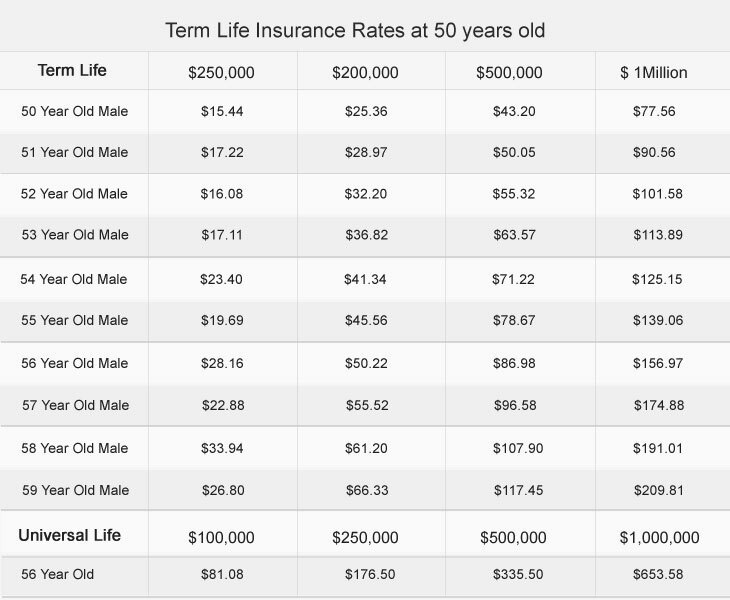 A woman got enrolled in term life insurance at 56 and the face value of the coverage policy was $250,000. The length of the policy was 20 years and all she needed to pay was $75 a month. The lady was a non-smoker of course. A man with the same age and health may miss on the opportunity to buy the same plan. For example a non-smoker male can get $200,000 coverage for a twenty year period at a monthly premium of $82. Smokers will have to shell out some extra bugs to enroll in term life coverage at 56. In some instances the premium may double to that of a non-smoker for the same policy and time-period may also be reduced. For example a woman who smokes will have to pay $150 a month for an assured sum of $250,000 for a 10-year term. A male smoker on the other hand will have to pay $200 every month for a plan with similar benefits.